SOUTH AYRSHIRE COUNCIL Provost Winifred Sloan hosted a Civic Reception to mark the opening of the Ayrshire Coastal Path, but an unsuspecting guest got the surprise of his life when the Provost presented him with something very special. 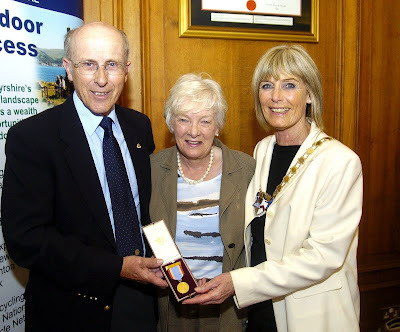 On very rare occasions the Provost of South Ayrshire Council presents a Provost’s medal to an individual, or a group of people, that they think has achieved outstanding things either personally or professionally. Speaking about the presentation Provost Sloan said: “All his life Dr Begg has worked tirelessly for the community, he has put others’ needs before his own, and made personal sacrifices to follow his chosen career path. “Giving seems to be second nature in the Begg family, his wife Helen was a nurse, their son Colin is a doctor, and their daughter Fiona is a physiotherapist. His family have all supported him and helped him to achieve his goals. Dr James Begg, or Jimmy as most people know him, was born in New Cumnock. He attended Glasgow University, and in 1968 became a General Practitioner in Ayr. He was a founder member of the Road Accident Emergency Service and of the Air Sea Rescue at HMS Gannet. For these achievements, and for his service to medicine, he was awarded an MBE in 1995. Having recorded many of his varied life experiences Jimmy has had several books published including two on his experiences with HMS Gannet as a Flying Doctor and GP at the base, one about the history of Ayr hospitals and one of Ayrshire poems in Ayrshire dialect. Jimmy was a Water Bailiff for a number of years, and it was during that time that he had a vision of creating an Ayrshire Coastal Path and now this has happened. There are currently 280 Ayrshire business stories permanently archived on this site. To locate those of most interest to you, please use the site search facility in the top left hand corner of this page. Type your search term in the white box, then click “SEARCH BLOG”.